An 80-year-old woman has died nearly a month after being involved in a collision between a car and a tractor in Langtoft . The 80-year-old woman was a front seat passenger in a small hatchback car when the collision happened on King Street, Langtoft, north of Peterborough at 4.55pm on Monday, 17 November. She was taken to hospital following the incident, but died from her injuries last week. Now police are appealing for witnesses to come forward to allow them to find out what happened to cause the incident. The 80-year-old was a front seat passenger in a white Mitsubishi Colt, which collided with a red McCormick Tractor towing a large set of rollers. No-one else was seriously injured in the accident, which happened about a mile north of the junction with the A1175. Langtoft Parish councillor Derek Risk said there was concern in the village about the road and a number of accidents that had occurred on it. He said; “There have been a number of incidents on King Street over the past few years, and there have been other fatal incidents on it as well. “It is a long straight road, and there is a ditch on one side of it. It is a national speed limit road. “There was another incident there this week where a car crashed into a ditch. “It is difficult to know what we can do to make the road safer. “I know a number of residents are concerned about it, especially the speed of some drivers who use the road, but there is no obvious way to make it safer. “Residents have been to our meetings to talk about safety on the road, and the parish council have looked into it in the past. 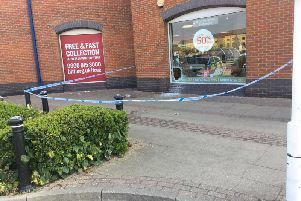 A Lincolnshire police spokeswoman confirmed no-one had been arrested in connection with the incident, and the investigation into the cause is still ongoing. Investigating officers would like to hear from anyone who witnessed the collision, or saw either vehicle prior to the collision. Anyone with any information is asked to call the Lincolnshire Police Collision Witness Hotline on 01522 558855 or the non-emergency number 101 quoting incident 302 of 17/11/2014.